Lovely, bright 20sqm double room with two bedside tables and access to the large terrace, available in a bright and quiet flat which is 135 sqm with two terraces, located in the district of “Eixample”. Equipped with new classical furniture, partly design and IKEA, wooden flooring and newly renovated. A fully equipped kitchen of 12 sqm, a 28 sqm living/dining room with large cupboards, a large table and six chairs, as well as two armchairs and access to the front terrace. 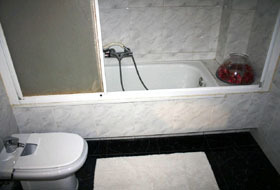 The apartment has three bedrooms and one other room with a large cupboard, a 5sqm bathroom with a bath and a toilet. 1st floor with lift. Smoking allowed. Pets not allowed. Reliable people only. Heating, Washing Machine, Microwave, Dishwasher, Fridge, Coffee Maker, Electric Iron, Oven, TV (cable and antenna), Video/DVD, Radio. Bed sheets and towels available. 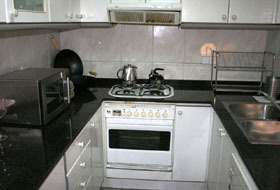 1 Pers/ Month/ 450 EUR + 2 months rent deposit + agency fees + 65 EUR utilities. Metro L5, L3 ; station “VERDAGUER”:From the Airport: Take the blue Aerobus A1 from the airport to “Plaza Catalunya”. Change to metro line L3 and stop at the station “Diagonal”. Then take the line L5 to “Verdaguer”. You are a 5 min walk from the apartment.From train station “Sants”: Take the metro line L5 and stop at the station “VERDAGUER”. You are a 5 min walk from the apartment.